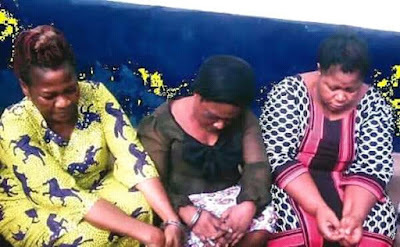 Police detectives attached to the Aba Area Command in Abia State have arrested three women in connection with the trafficking of a set of twin baby boys in Aba, the commercial hub of the state. According to Punch, the detectives , who were on a stop- and-search duty on Aba-Port Harcourt expressway first arrested one Ifeoma Ezeanodo with the two babies and on interrogation, she could not give a satisfactory account of the babies. According to a police source , Ezeanodo later said she adopted the babies from one Ifeoma Nwogu , who claimed she was operating a motherless baby ’ s home in Aba. The source also added that her confession led to the arrest of the second and third suspects in the matter. Narrating her ordeal at the Police Officers Mess in Umuahia, the state capital, Ezeanodo said she wanted to adopt baby boys since she had only girls. But Nwogu insisted that she gave the babies to Ezeanodo in order to ensure that they were raised in a good home. Nwogu said, “I have a motherless babies’ home that I registered with the Abia State Ministry of Women Affairs. A volunteer brought a set of twin baby boys to my home and after asking her the source of the babies, she told me that they were abandoned babies and the best thing to do was to give the babies to a home. “I adopted the babies to a woman who paid me N1.5 million and I gave the person that brought the babies to me N 500,000 and handed over the baby to the woman. However, police investigation revealed that Nwogu could not provide the certificate that empowers her to run a motherless babies ’ home. A search on her alleged home revealed that there were no motherless children there. Nwogu argued that the police never demanded a certificate for running the motherless babies’ home. “I told them that for some time, we have not been operating ; that is why we don’t have babies in our home now and they did not demand my certificate ,” she insisted. When asked how long the twin babies she took to Ezeanodo stayed with her, she said she gave out the babies the same day the volunteer brought them to her. She said, “This is my first time of doing this kind of business. One girl came to me and said she is a student and she didn ’t have anybody to help her take care of her babies and she did not want to kill her children . “She asked me to help her sell them. I asked her of her place and she said she is from Warri. That was how I called the woman that said she was looking for baby boys to adopt the children through a woman, who said she runs a motherless babies’ home.